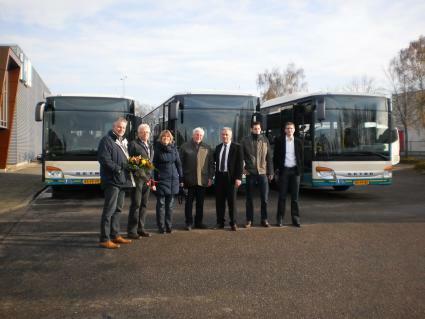 From the hands of Setra Sales Manager, jab of Lamoen, Mr. Arjen Juijn, Director Juijn Transport Company, seven new Setra S 415 NF low-floor buses received. There are many good reasons for demanding line and regional carriers to the multi-class low floor to choose Setra. Because the next Setra low-floor high technology, modern safety and design level coach has made him a true multi-talent and a ‘Best in Class “when it comes on line or regional. With high-quality low-floor technology and equipment and comfort, the S 415 NF as the best equipped for flexible deployment. As “Bus of the Year” in 2009 he received the award as best European bus. As of December 12, 2010 carrier takes over from Arriva bus services in the concession Syntus Achterhoek. The Riverland concession remains under the banner of Arriva. The seven new Setra S 415 NF low-floor buses from transport company, as of December 12, 2010 Juijn on lines 165 and 166 colors Arriva ride. Copyright 2010 Buszone | Designed by Zoarra WP Themes | Powered by WordPress, Installed by Installatron.